Choosing the right interior door is imperative for capping the stylistic theme of any room. The wrong door can break the design flow of a living space in a heartbeat, with an unsuitable doorway quickly becoming an unwanted focal point of a room. Even the best, most cutting-edge design work can be disrupted if you don’t have the right door. In this article, the Extreme Design team will guide you through the best doors for your home. We’ll examine both styles and materials, providing you with all the advice necessary to make the right decision when purchasing a new door. As we have mentioned, a substandard door can truly ruin the look of an entire room; but what makes a door bad? Of course, that’s entirely subjective. More than anything, the door needs to suit the room. 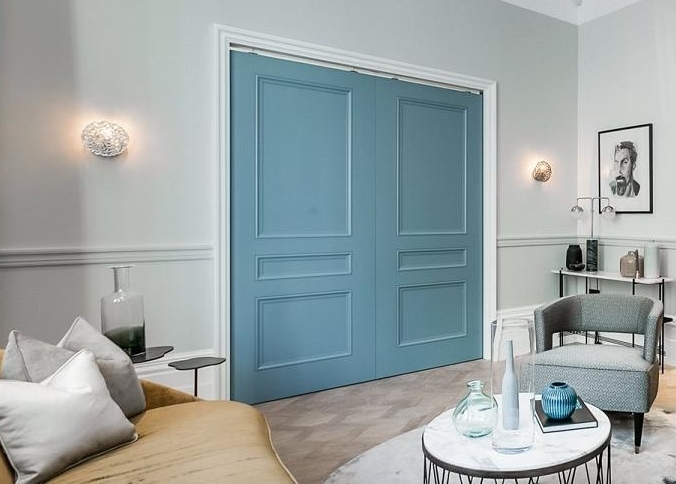 Being aware of the different styles of doors available to you will certainly help you to make the right choice – a standard four-panel door, though traditional and rather neutral, is not always the best choice. To begin with, you’ll have to understand which stylistic theme best describes the room in which you’ll be installing the door. If you have a more rustic and traditional room, it makes sense to opt for a more rustic, traditional door. Domineering hardwoods such as oak or pine are ideal materials for an imposing door in a traditional home; the natural grain and classic panelled look of this style can help to add a luxurious edge to a more traditional room. You could choose to paint a door such as this, but they often look just as good – if not better – when left with their natural colouration. For a more modern, minimalist room the possibilities are endless. A more traditional door has the potential to work well, but too often they can make a modern room look old fashioned. Avoiding traditional doors doesn’t have to mean avoiding wood, however. While a glass or metal door can certainly add a unique touch to a room, wooden sliding, bi-folding or Japanese shoji-style doors can be equally as captivating. In any style of room, choosing a more unique doorway can work wonders. If you have a flair for the dramatic, double doors will be a welcome, bombastic addition to any room. Sometimes, the best door may be no door at all. If you have a large, open plan home, simply relying on arches with only a curtain as a door can bring a romantic edge to any room. Solid wood, solid core, or hollow core? Once you’ve decided on a style of door, it’s time to consider the actual material that will best suit the purpose of your doorway. When it comes to wooden doors, there are three main styles you are able to choose from: solid wood, solid core and hollow core. We’ll examine these materials below. Sturdy, traditional and always natural looking, it’s very difficult to replicate the quality of solid hardwood doors. Like the great doors to a nobleman’s hall they have an enduring, imposing edge, while the natural wood grain adds a touch of heritage to just about any room; whether rustic or more contemporary. Plus, they’re incredibly strong and durable. With a bit of care, a solid wood door can last more than a lifetime. While the grain present in these doors gives real character to the wood, it can make them difficult to paint or fit into a hyper-contemporary room. Furthermore, despite their durability, longevity and all-round strength, solid wood doors are at risk of warping. Exposing one to moisture, or placing it in an area where it is likely to experience major temperature changes can cause irreparable warping, to the point where the door is unable to close correctly. Ultimately, solid wood doors are perfect for any older home, but will also fit into many contemporary designs too. If you are looking to go for an exceptionally modern feel, the natural look of solid wood may interfere with more clinical or industrial designs. But be aware that if you do choose solid wood, be sure not to use the doors where they will be exposed to large amounts of moisture without ventilation. While solid wood doors are made from a single piece of hardwood, solid core doors are built by surrounding an MDF core with plywood or moulded composite. While some may turn their nose up at the idea of installing an MDF door, they aren’t simply flimsy plywood more at home in an aged 1970s flat. Of course, they may not have the rustic character of solid wood doors, but they are often just as good in terms of soundproofing and heat retention. 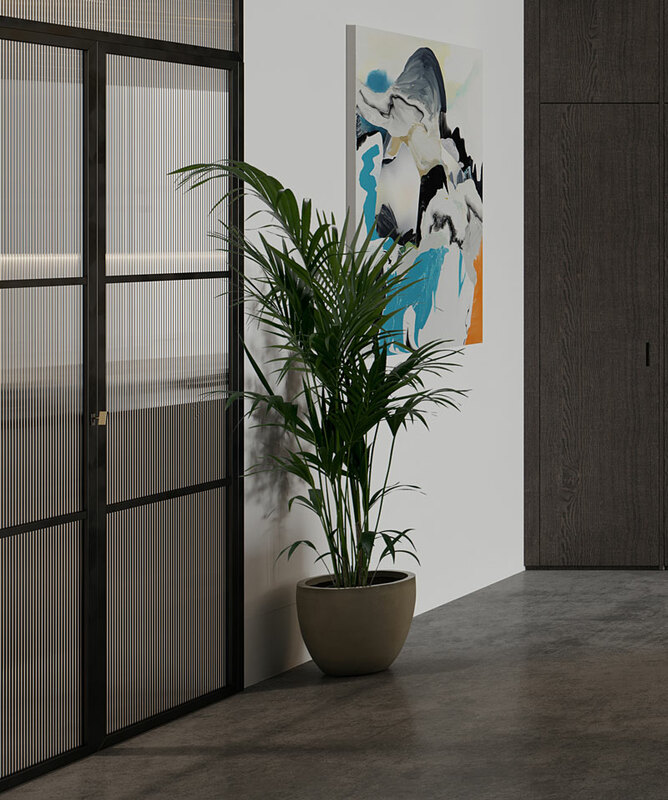 Due to the materials used to make solid core doors, they are usually very easy to paint and can be altered in a number of ways to include interesting bespoke design features. If you’d rather a more natural look, more often than not, they come with flat, unmoulded faces, making them ideal for use in a modern home. While they can look excellent in very modern homes, it’s true that a solid core door can never replicate the look, feel and true sturdiness of solid wood doors. Despite this, for those looking to create an unbroken, perfectly modern design in their home, solid core doors are an excellent choice. A cheaper option than solid core doors, hollow cores are made up of only two pieces of plywood with nothing in between. They are a budget option that we would not recommend as they tend to lack any soundproofing or heat retention qualities and lack any substantial durability. With something as important as the doorways in your home, it is important to have doors capable of doing their job. That means investing in a high-quality, durable door should be a priority. When it comes to doors, spending the extra money on a solid wood, or even solid core, door can make a major difference to your home. 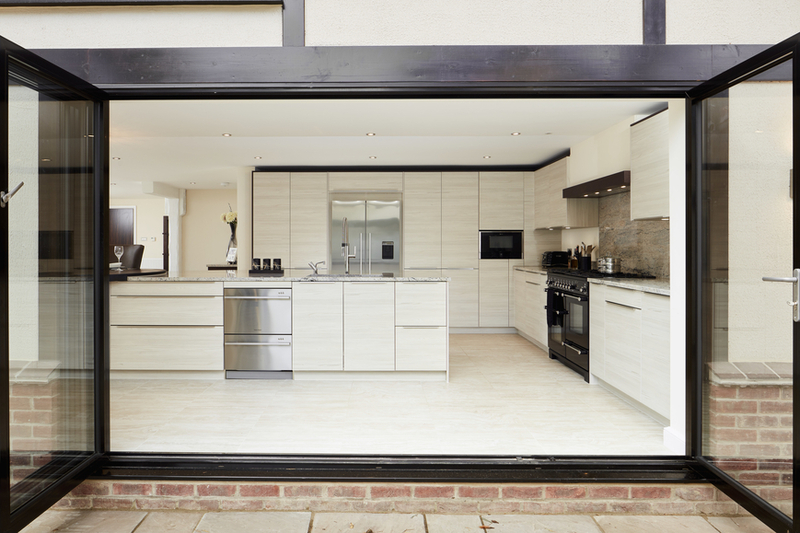 If wooden doors don’t fit the story told in your kitchen design, we’d recommend using metal and glass doors instead. These kinds of doors lend a progressive feel to any room. In particular, a modernist’s dream – the industrial kitchen. Combine a chic metal and glass door with prominent use of stainless steel to bring about a kitchen that is sure to stun and amaze anyone who walks through the doorway. Glass doors are perfect for contemporary open-plan homes as they offer an uninterrupted view between rooms and create a sense of flow between even when the doors are closed. For a glass door with an industrial edge, ‘Crittall’ doors – named after the company Crittall that created the original doors in 1883 – have seen a resurgence in recent years. Originally used for businesses and commercial buildings, these doors add a contemporary industrial look to any home. 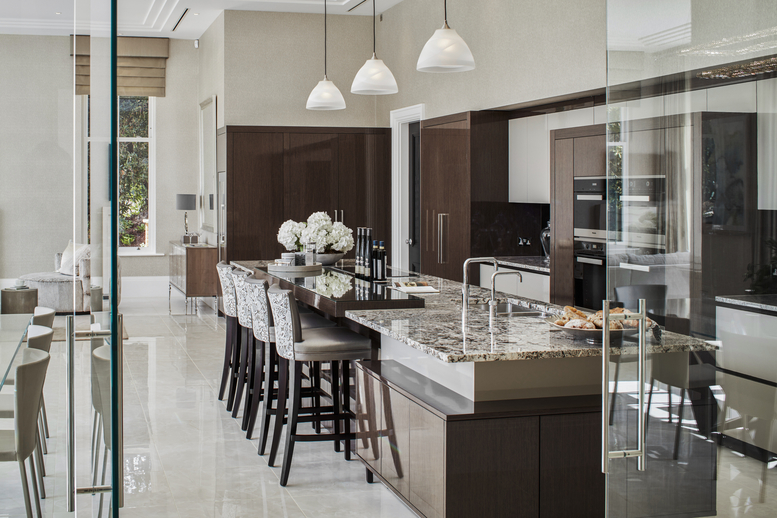 We love the semi-opaque Crittall doors in this contemporary Extreme kitchen design. For expert advice on discovering the best doors for your home, visit our studios and bring your story to life by collaborating with our designers.